I did scan through the suggestions already sent in but couldn't spot anything like this. 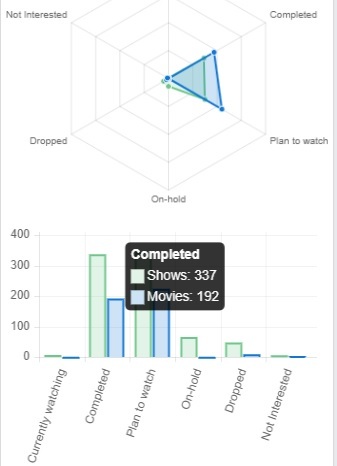 One of the features I really like over on MyAnimeList is that it has a complete breakdown of your stats, similar to the pie chart on MDL but in just numbers, shown below. I think it's a really easy way to just go to certain aspects of your watch list and it's easier to see your breakdown of stats in general. Movies could be broken down even into how many series completely (such as, you can mark the whole Ju-on series as completed upon watching all movies - such as the chapters, volumes, etc. statistics on Manga Stats) and I just think this is a much more clear cut way of viewing statistics and would love to see something like this on MDL. if you go to the bar chart in your profile (not Settings), and hover your cursor over a particular bar it gives you the number for that category. Not sure if you saw this already but sharing just incase.